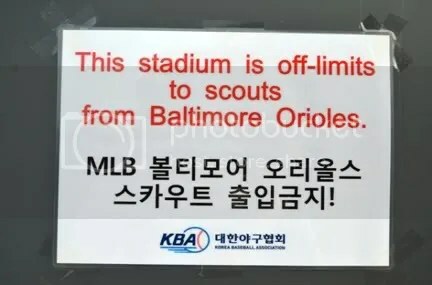 New Orioles General Manager Dan Duquette has made no secret of the fact that he wishes to expand the O’s presence in foreign scouting markets, especially those in Asia. While Asian baseball hasn’t produced any real superstars other than Ichiro, more than a few serviceable major league players have come over to the United States from Japan, Korea, and other nations. So far already in his tenure, Duquette has brought in a couple Asian pitchers to camp, Wei-Yin Chen (Taiwan), and Tsuyoshi Wada (Japan). The banning stems from a fracas back in February where the O’s apparently skirted some rules regarding their courting of a high school pitcher (one who, others have noted, no other MLB team was even showing an interest in). Just another proud day to be a fan of the Baltimore Orioles. This entry was posted on March 20, 2012 at 10:00 am and is filed under Orioles. You can follow any responses to this entry through the RSS 2.0 feed. You can skip to the end and leave a response. Pinging is currently not allowed. So what? Not like Asia is some hot bed for baseball prospects. If they were banned from Latin America then it’d be a story. They were banned from a country. That’s a story, whether it’s Venezuela, Mexico, or Petoria.